Tommy’s is a AAA Approved full-service auto repair and maintenance center dedicated to providing you with Carefree Car Ownership. 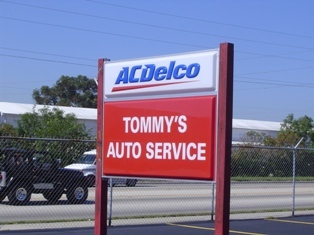 Conveniently located in the heart of St. Petersburg on 22nd Avenue North between I-275 and US-19, Tommy's staff of ASE Certified Auto Repair Technicians use AC Delco parts to care for your car and keep it running safely and dependably. Call (727) 323-1444 to speak with an Auto Service Advisor, or click here to schedule a Service Appointment online. Either way, you and your car will be treated so well; you’ll feel like Tommy’s is Your Car's Best Friend. When you bring your car into Tommy’s for maintenance, you will receive friendly service and your car will receive professional care. Tommy’s ASE Certified Car Repair Technicians have been trained to service your car efficiently while keeping an eye out for other problems that may be lurking. Your Auto Service Advisor will inform you of the results of the service you requested and advise you of any work we recommend.